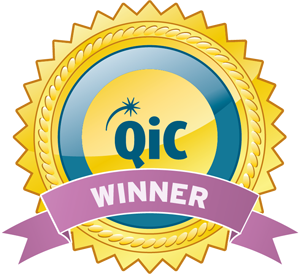 In 2015 the Diabetes Inpatient Care and Education (DICE) programme won a QiC award for ‘Best Improvement in Quality of Inpatient Care Initiative’. The programme demonstrated reduced harm to patients with diabetes in Ipswich Hospital after establishing a fully staffed, proactive inpatient diabetes team focused on improving care through staff education, innovation and implementation of new systems of care. The innovative tools included: an admission avoidance service; the DICE Chart (an individualised care pathway); an innovative referral/triage system (the Diabetes Patient At Risk score); use of web-connected blood glucose monitors with hypoglycaemic alerts; strategies to prevent nocturnal hypoglycaemia; a junior doctor induction programme; a foot protection pathway and education of all staff on the new pathways and guidelines. Overall, hypoglycaemic rates (<4.0mmol/l) reduced by 25% but severe hypoglycaemia (<2.2mmol/l) reduced by 46%. Heel ulceration fell more than in the non-diabetes population (56% v 25%). Length of stay fell by approximately one day. A composite of hospital-acquired complications fell 23.0%. 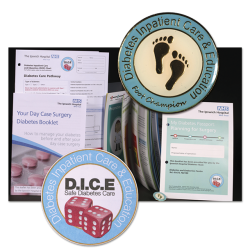 This latest submission relates to the expansion of the DICE project, new initiatives to sustain staff engagement, new tools to promote patient empowerment, dissemination of learning to other Trusts and evidence of uptake. Reductions in hypoglycaemia and length of stay have been sustained; a monthly audit continues to drive improvement; the education programme has been expanded Trust-wide; foot champions have been introduced across the hospital and a patient-held ‘perioperative passport’ has been developed. The Ipswich Touch Test is being used internationally (USA, Canada, Australia), while the passport has been requested by over 20 hospital Trusts.